The six-headed comedy band The Horne Section are set to embark on their first ever national tour with their latest show That’s How I Like My Tour, bringing their raucous comedy shindig across the UK on a 36-date tour from 4th February to 5th December. Tickets can be found at thehornesection.com. 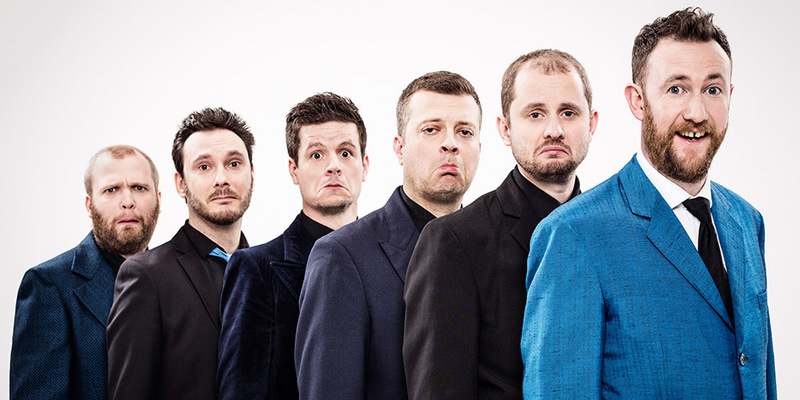 Unruly, ridiculous and surprisingly satisfying, The Horne Section combine music and comedy in a typically unpredictable way, blending stupid songs with a carnival atmosphere and plenty of puns. Expect a mixture of toe-tapping tunes, exceptional musicality, and 5 talented musicians being made to do silly things by bearded comedian, and creator & star of Taskmaster, Alex Horne. The band’s TV credits include regular appearances in Dictionary Corner on 8 Out of 10 Cats Does Countdown (Channel 4), The Royal Variety Performance 2018 (ITV), Last Leg Christmas Special (Channel 4), as well as the 2 hour special The Horne Section Television Programme on UKTV’s Dave. Filmed at the London Palladium in front of a sold out live audience, the variety show featured guest appearances from Sue Perkins, Sara Pascoe, Joe Wilkinson, and Girls Aloud’s Nadine Coyle. Away from the stage, their podcast The Horne Section Podcast reached number one in the iTunes charts on the first day of its release and features a variety of guests including Nish Kumar, Richard Osman, Roisin Conaty, and Rick Edwards. The band have previously hosted three series of Alex Horne Presents The Horne Section on BBC Radio 4. The band have performed to numerous sold-out audiences at the Edinburgh Festival Fringe as well as at The Lyric Theatre – Shaftesbury Avenue, The Criterion Theatre and The Hackney Empire, Udderbelly Festival – Southbank, and The Leicester Square Speigletent. Acclaimed comedian Alex Horne is the unmusical band leader at the helm of The Horne Section. Alex is the creator and co-host of the Broadcast Award winning and International Emmy, BAFTA, Royal Television Society, & Broadcasting Press Guild nominated show Taskmaster which returns for its eighth series later this year on Dave and is the most watched original UKTV commission. An international hit, Taskmaster’s format has been sold to several other countries developing their own versions including Comedy Central in the U.S. (starring Reggie Watts as the Taskmaster), TV 2 in Denmark, VTM in Belgium, TVE in Spain, and two series on Sweden’s SVT channel. Alex is an Edinburgh Fringe veteran taking nine solo shows to the festival and earning an Edinburgh Comedy Award nomination in 2014 following a Best Newcomer Award nomination in 2003. All singing, all dancing and all joking this show is brilliantly witty and refreshingly silly. A must see for musical comedy fans!